Over 40 Ste. Genevieve County Memorial Hospital (SGCMH) employees and auxiliary members attended the Missouri Hospital Association’s Awards Luncheon on November 5 where Rita Brumfield, Chief Nursing Officer and the SGCMH Auxiliary were recognized. 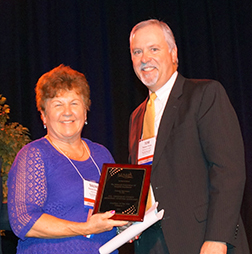 Brumfield received the Nurse Leader Legacy Award for 50 years of dedication to the nursing profession. “Legacy truly means gift, and this describes this recipient,” said a member of the Missouri Organization of Nurse Leaders as she announced Rita’s name. In accepting the award, Rita said she was truly wowed by the honor. “Anytime you get an award like this you have to stop and think about who else is responsible. There are a lot of people in my past who helped me along my path. I had three great mentors Elenor Degenhardt, a previous nurse leader; Karen Hendrickson, vice-president of nursing at southeast health; and my first CEO, Pat Bira. Then there’s my family. They always knew what nursing meant to me, supported me and put up with all the erratic hours. And my hospital family, of which we have a whole crew here today. It truly is a family atmosphere. We’re a team and we all pitch in to do whatever it takes to get the job done. Tom Keim had the honor of presenting the Auxiliary of the Year Award to SGCMH in Category I, hospitals with less than 31 licensed beds. “I may be biased, but this group of volunteers is our greatest ambassadors and highly-valued as members of our hospital family and health care team,” he said. “With Naomi Glassey as the driving force behind this auxiliary of 90-plus active members, they have accumulated over 15,000 volunteer hours this year alone, which includes over 11,000 in-hospital hours and nearly 3,700 community volunteer hours. They also donated more than $58,000 to the hospital this year and purchased seven new hospital beds, with the promise of more to come. The auxiliary stays very busy with hospital in-service and community health education projects. They award scholarships to students pursuing health careers; they quilt dozens of hand-made baby quilts a year to sell in our gift shop, and who knows how many raffle tickets they’ve sold! And, these are just some of their activities! Naomi Glassey, president of the SGCMH Auxiliary and also Missouri State Auxiliary President, accepted the award.